China wants to boost cooperation with members of the Association of Southeast Asian Nations to develop trade and increase investment, said Chinese Commerce Minister Chen Deming. Five Southeast Asian nations may set up a rice-trade association next year to cooperate in stabilizing rice prices, a Thai official said. Thailand, Vietnam, Cambodia, Laos and Myanmar will also cooperate on other issues related to food security and production, said Chiya Yimvilai, a spokesman at a meeting of Asean economic ministers in Bangkok. The countries would also work together on developing rice products, he said. Petroleos de Venezuela SA and a group of Russian oil companies plan to spend $30 billion on a joint venture in Venezuela’s Orinoco region. The 40-year venture will seek to produce crude in the Junin 6 area and may expand to other Orinoco blocks, Russian Deputy Prime Minister Igor Sechin told reporters in St. Petersburg today after meeting with Venezuelan Vice President Ramon Carrizalez. Russian investors will include OAO Gazprom, OAO Rosneft, OAO Lukoil, TNK-BP and OAO Surgutneftegaz. The venture will be signed “in the coming months,” Sechin said. Mexico president Felipe Calderón and Uruguay’s Tabare Vazquez signed on Friday in Montevideo a Strategic Association accord to strengthen political dialogue and bilateral trade relations in the framework of the 2004 free trade agreement. The next arrival to Lima of Brazilian President Luiz Inacio Lula da Silva will contribute to create a new strategic alliance to face Asian markets when signing several trade agreements, the President of Peru-Brazil Integration Chamber Miguel Vega Alvear. “The Chinese don’t have enough nickel, don’t have enough oil, and they don’t have enough copper. There’s a crisis coming. They are going around the world buying up what they can. They’re preparing for a rainy day." Jim Rogers, chairman of Rogers Holdings and the author of books including “Investment Biker” and “Adventure Capitalist”, said in a telephone interview yesterday. "The idea is to resurrect this notion of if you really want to go off, and you really want to go cover the world, you need to be your own business person. You need to go out and create your own portfolio of freelance strengths and this is a great tradition of great foreign correspondent who have done this." Vietnam's first ETF, which tracks Market Vectors Vietnam index .MVVN, not the country's Hochiminh index began trading today. The Market Vectors Vietnam ETF (VNM) will be the first U.S.-listed ETF exclusively dedicated to Vietnam, mirroring the performance of the Market Vectors Vietnam index .MVVN, which tracks companies that generate at least 50 percent of their revenues in the country, Van Eck said in a statement. "Vietnam is one of the world's most populous nations, and its well-educated, young population -- nearly half of the country's 90 million residents are under the age of 25 -- provides strong underpinnings for local economic growth," Van Eck said in the statement. China's Ministry of Industry and Information Technology (MIIT) Thursday announced a three-year moratorium on approvals of new expansion-related proposals in the iron and steel industry, as the government pledges to eliminate outdated capacity. China's top negotiators in the bitter and protracted row over the price of iron ore seem destined never to agree - risking a loss of face that will raise questions about whether they are up to the job and who it is they are actually representing. Their apparent refusal to compromise is damaging the competitiveness of smaller domestic steel mills, forcing them to buy from their larger counterparts, say analysts. The bigger firms have been content to pay whatever the spot price is for ore and pass on the premiums. China National Petroleum Corp (CNPC), the country's largest oil and gas producer, will speed up overseas acquisitions in regions such as Africa and South America this year, in a bid to boost China's quest for energy security. A large-scale restructuring of the coal industry in China's major coal-producing province of Shanxi, starting at the end of this month, will reduce accidents and improve efficiency by shutting down small coal mines, officials said. "The restructuring this time is the largest after years of adjusting the coal industry's structure," Miao Huanli, planning section director of Shanxi provincial coal bureau, said yesterday. Chinese oil conglomerates China National Petroleum and Cnooc have offered to pay an estimated $17 billion usd for all of Repsol YPF's state in its Argentine unit called YPF. You can read the Wall Street Journal's paraphrased article (the original costs money) at thestreet.com, by visiting this article. Will this deal actually be completed? China South America reported on this possible deal back on July 7, 2009. You will notice, the offer at this point was only $14.5 billion for a 75% stake. China has since upped the offer and is now looking to buy the entire thing. Why China? Are you angry over Australia rejecting your Rio bid? Are you feeling flustered that countries from the industrialized world, but also in Africa and Latin America are starting to think twice about selling the rights to their raw materials? The relative strength or weakness of domestic currencies such as the Ausie Dollar, Argentine Peso, Peruvian Sol and Brazilian Real, are all inherently linked to the global market price of the commodities the countries export. [ie: if the spot price for copper drops 50%, observe what happens to Peru and Chile's Peso's. Argentina's government has no financial stake in YPF, but nonetheless under Argentine law has the right to veto decisions such as transfer of ownership. In my personal opinion, this translates into who is willing to pay more “under the table” to the Argentine government. China National Petroleum and Cnooc are state owned organizations. Despite their growing influence and presence in oil markets around the world, many governments still remain weary of doing business with companies officially tied to a foreign government. Jonathan (Jono) Warren is a friend of mine who is currently living in Beijing, but is moving to Kashgar, Xinjiang. You know the place where all the riots occurred a little while ago. He is beginning a tea business, where he will be importing Pakistani tea into China, packaging it in China and then selling it to super markets in the West. Here is a small excerpt from his most recent post "I sing, you sing, we all sing"
Up in Changbaixian, Liu Baiguo was that grower. The owner of a local Chinese-medicine shop (中药房), recommended Mr. Liu as his farm was the closest to the city, but produced some of the best ginseng. Liu walked into the shop and asked for the ones who were looking for him. He seemed genuinely excited to be able to show his roots to two bright-eyed American entrepreneurs. Brazilian federal power holding company Eletrobrás (NYSE: EBR) is planning to buy a Peruvian generator to participate in an upcoming hydro auction in Peru, company CEO José Antonio Muniz Lopes told journalists. The executive declined to say which generator Eletrobrás was looking to acquire but said the purchase was essential for the Brazilian holding group to operate in Peru. Energy ministers from Brazil and Peru announced details of plans for several hydroelectric plants to be built in the Andean nation, saying after a meeting that 80 percent of the energy generated by the stations would go to Brazil and the rest to Peru. Both partners will have the right to sell their respective energy quotas to other South American countries, Brazilian Mines and Energy Minister Edison Lobao said Friday after a meeting in Rio de Janeiro with his Peruvian counterpart, Pedro Sanchez. The first five power stations – to be built in Peru’s eastern lowlands at a cost of between $12-15 billion – will generate a combined total of 6,000 megawatts annually once they come on stream in 2015. Peru and South Korea examine on Wednesday the progress of the bilateral agreements achieved by Presidents Alan Garcia and Lee Myung-bak during the summit of leaders of the Asia Pacific Economic Cooperation (APEC) held in Lima in November 2008, the Korean Embassy reported. "The agreement achieved last year includes mutual cooperation in oil, mineral and natural gas sectors", the Ambassy reported. Peru’s Government and the Japan International Cooperation Agency (JICA) will invest 70 million soles (around 23.7 million dollars) in the construction of 6 new docks located along the Peruvian coast, reported today Production Minister Mercedez Araoz. Prime Minister Vladimir Putin said Tuesday he was ready to promote an “energy alliance” of global oil giants Russia and Venezuela, and confirmed his willingness to study Caracas’ requests for additional arms purchases. Putin told Venezuelan Energy Minister Rafael Ramirez that Russia will employ “the most modern equipment and technologies” to carry out plans for cooperation with Venezuela in the oil and gas sector. The accord was struck by representatives of the ministry and the state-run firm Cafe Venezuela last Friday and represents $4.1 million in revenue for small producers and family cooperatives in southeastern Brazil. I thought it was very appropriate and a nice coincidence that upon returning from my business trip to China & Singapore, I turn on my blackberry and am flashed with this NYT article: American Graduates Finding Jobs in China. “When I came over to China in 1994, that was the first wave of Americans coming to China,” he said. “These young people are part of this big second wave. Let's be honest. China has not escaped the shocks of the global economic recession. There are empty office and commercial buildings around Beijing’s Central Business District. Rents are sky rocketing and apartments are remaining unsold and unoccupied. Factories are closing in Southern China. Political turmoil has touched regions where minorities are great in number. And… so on. Nonetheless, after living and working in the country at the beginning of the crisis (Sept - Dec 08), and returning to do business this past month—the fact remains there is one thing you can find in China that is missing from my colleagues and friends here in the North-Eastern United States, down in Lima, Peru and Belo Horizonte, Brazil and across the pond in the UK and France. 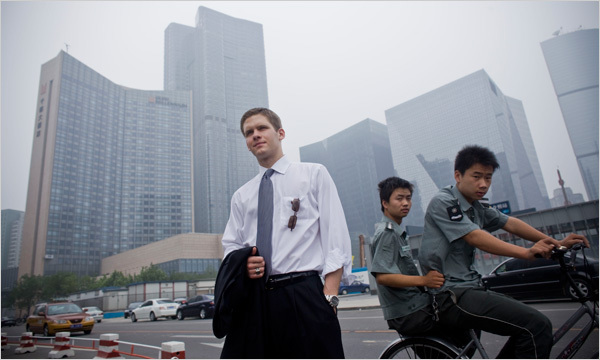 Walk the streets of Beijing and the city is full of people just as the NYT article above describes; motivated and adventurous young entrepreneurs and professionals from all walks of life that have come to China to build their respective futures. Likewise, a considerable portion of China’s younger generations remain confident and positive about their futures. In a country of 1.4 billion people (probably more) you will hardly ever find a general consensus. What applies in Beijing, will not apply in western China in the city of Xinjiang. This does not change the fact, that the life styles and future aspirations of China’s youth are considerably different than those of their parents and grandparents. The Chinese are not ignorant; they know things are probably worse than their government lets on. At the same time, critics in the west are too quick to point fingers and predict imminent economic collapse. Sometimes it is a bursting real estate bubble, an over-valued stock market due for a correction, plunging exports, or decreasing import demand. Critics will always find a way to well… criticize. China South America will be returning to cyber space tomorrow, Aug 11, 2009. I apologize for the recent absence of updates, I have been traveling in China where access to sites such as this is limited. We'll return to China South America's usual mix of current events relating to China & South America, commodity markets, micro finance and of course my own analysis and writing on the world.